If the weather's getting you down, take a break to the sun-soaked South Seas with the Tiki Wonders slot from software provider NetEnt. Pineapples, calm blue seas, friendly dolphins, coconuts, and a generous splash of cash (if you're on a roll) all await in this five-reel game. Adjustable stakes, a decent return-to-player rating and free spins are all packed into this Polynesian paradise. Who knows, after a read of this guide and a few games on the slot itself, you might even be able to afford your own island, thanks to the progressive jackpot. 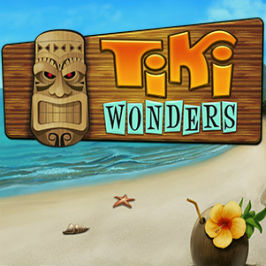 Play Tiki Wonders for Real Money! 100% Welcome Bonus up to €200! Since relaunching under the current name in 2008, NetBet has become one of the premier slots casinos on the web. Offering close to 500 different slot titles from the industry's leaders in game development, it's a surprise Irish gamers would spin anywhere else! Staking claim as the world's leader in mobile iGaming, LeoVegas is considered one of first non Irish-based operators to make their way to the upper echelon of online casinos in Ireland. Referred to as one of Ireland's premier online casinos, the Swedish-based brand is ready to continue dominating the Irish slots scene for years to come! 100% Welcome Bonus up to €100 + 200 Extra Spins! This is a bright and colourful slot, and NetEnt has done a great job of giving it loads of character and atmosphere. The Tiki statues themselves can be found by the side of the reels, and the pleasant backdrop of a beach, the ocean and a volcano is nice to look at while you're spinning. The bet level, coin value, and other important info is all displayed in a separate white bar at the bottom of the screen, which is very clear and easy to read. The symbols themselves are cheerful and nicely drawn, and there's no room for confusion if you're looking out for a wild etc. Despite the fact that all the symbols look great and include a mix of coconut cocktails and tropical wildlife (like lizards, sea turtles, and an especially cheerful bird), the ones you want to watch out for are the dolphins, who'll pay out the highest when matched. Bet-wise, you can set your stake at anything from 0.01 coin to 60 coins per spin, so there's a nice range to match your mood, depending on how adventurous or lucky you're feeling. This online slot also has 30 paylines over five reels with a return-to-player of 93%. There are scatter, wild, and bonus symbols too, which we'll look at next. The grass-skirted hula dancers are the scatters, and you can grab up to 30 free spins if you can match these up. There's also a decent 3x multiplier on your free spins. The wild symbol is the surfer. Although the free spins are the only actual bonus feature, the multiplier is a little bit higher than what you'll find on most slots, which makes up for the lack of other modes. There is still the progressive jackpot though, which can blow all your other winnings out the water entirely if you're lucky enough to net it. This is because the prize pool is shared with those of Geisha Wonders and Icy Wonders. If you look out for the glowing yellow star on the reel symbols as you play, you'll be able to identify which symbols have been chosen as the triggers for the progressive jackpot. If you can get four in a row from left to right on any payline, you'll win a wonder jackpot. Get five, and you'll get the whole pot. Overall, this is a fun, easy-going and satisfying slot to play, no matter how big (or small) you want to bet. Share this Tiki Wonders Review today! If you like Tiki Wonders, you'll love these slot titles too!